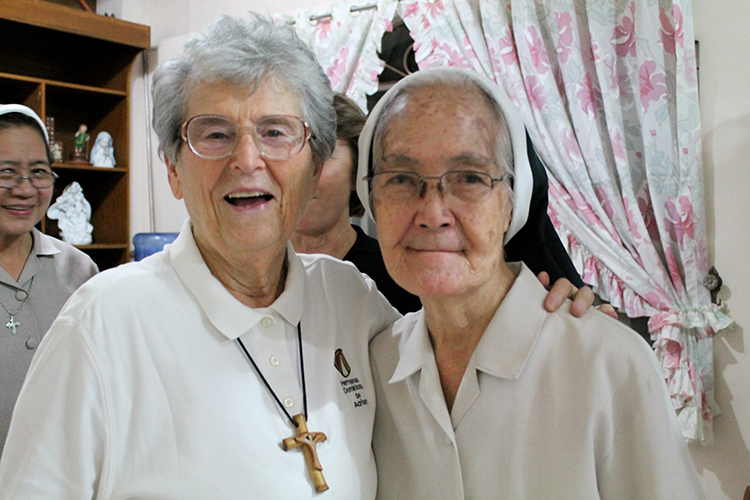 December 13, 2018, San Fernando, Pampanga, Philippines – A visit to the Philippines brought two Adrian Dominican Sisters the opportunity to explore the many ministries of Sisters in the Congregation’s Our Lady of Remedies Mission Chapter, time to cherish the renewal of friendships, and to bid farewell to a Sister who passed to the next life. The visit was hosted by Sister Rosita Yaya, OP, Chapter Prioress of Our Lady of Remedies, and by the Sisters of the Chapter. Sister Elise D. García, OP, General Councilor, was accompanied on the trip by Sister Marcine Klemm, OP, who lived and ministered with the Sisters from 1968 to 1973 when their mission was first taking root in the Philippines. At the request of Bishop Emilio Cinense, Bishop of the then Diocese of San Fernando, Mother Gerald Barry in 1961 agreed to help in the formation of a group of Filipina women into religious life. Four young women completed the formation process in Adrian, Michigan, and in 1965 returned to their country to begin a new life. Sister Marcine later ministered and lived with the Sisters of the Dominican Congregation of Our Lady of Remedies. In December 1972, the Remedies Sisters became an independent Congregation. At their request, the relationship of the two Dominican Congregations came full circle, when in November 2011, the Remedies Congregation merged with the Adrian Dominican Sisters. Sister Marcine, always revered by the Sisters in the Philippines, was fêted on November 30 with a surprise 90th birthday party, about six months early, at the San Fernando Motherhouse of the Our Lady of Remedies Chapter. The celebration included the Sisters from the Chapter, as well as people whom Sister Marcine had known from the 1960s and 1970s: Archbishop Emeritus Paciano Aniceto, former students, and friends. But the focus for much of the visit was on the present – on collaboration with the Dominican family in the Philippines and on the ministries in which the Sisters are engaged. The Sisters offer ministry, support, and presence to people who live in impoverished areas. On December 1, Sister Elise participated with a number of the Sisters in the annual Dominican Family day in Manila, attended by more than 300 Dominican women and men from throughout the Philippines. “The focus was on strengthening collaboration and the two examples given of strong collaborative efforts involved our Sisters,” she said. On the way back to San Fernando, the Sisters dropped off Sister May Cano, OP, who is now living in the Diocese of Caloocan in northern Manila, working closely with Bishop Pablo Virgilio S. David in coordinating a diocesan-wide program to assist families of victims of extrajudicial killings. “While we were there, the bishop, who has publicly criticized the government’s war on drugs, was in the news as the subject of slanderous accusations by President Duterte,” Sister Elise recalled. From left, Sister Lourdes Pamintuan, OP, addresses the children at Dominican School of Apalit. Students at Dominican School of Apalit welcome their visitors with dance. In the two schools that the Sisters visited, they were welcomed with “song, dance, recitals, and gifts,” Sister Elise said. 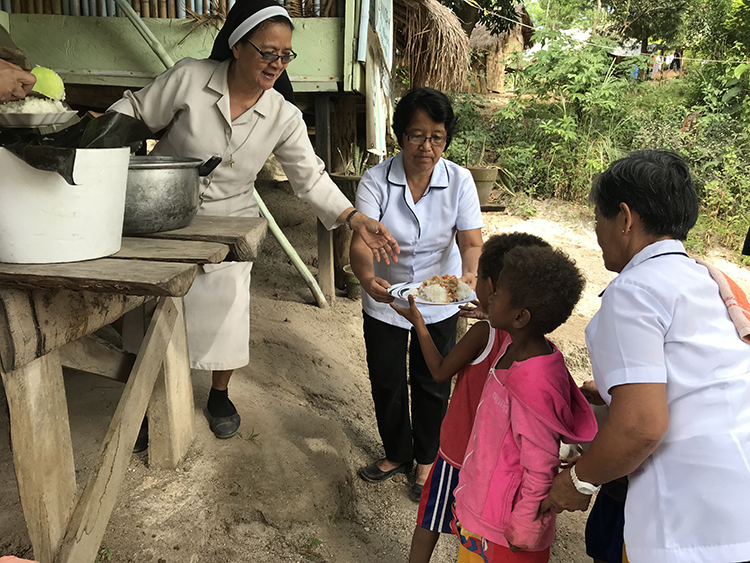 At Dominican School of Angeles City – which recently celebrated the addition of a new building to accommodate its growing enrollment of more than 200 students – Sisters shared lunch and toured the water purification site. Ministering at Dominican School of Angeles City are Sisters Meliza Arquillano, OP, Victoria Changcoco, OP, Liberty Mendoza, OP, Arsenia Puno, OP, and Michelle Salalila, OP. Sisters Elise and Marcine also received a warm welcome from the Sisters ministering at Dominican School of Apalit, an elementary and high school founded by the Sisters more than 20 years ago. Administrators of the school are Sisters Rowena M. Cruz, OP, Ruby Lumanlan, OP, and Lourdes Pamintuan, OP. Sister Gudelia “Guday” Kabigting, OP, serves the children at Diaz with the help of a member of the Dominican Laity. Sisters Liza David, OP, Gudelia Kabigting, OP, and Ines Evangelista Manuel, OP, welcomed the North American Sisters to the rural communities of Villa Maria and Diaz. There, they minister with the indigenous Aeta people who have been displaced to the mountains from their farming homes since the 1992 eruption of Mount Pinatubo. Ministries at Villa Maria include a school and a feeding program for 300 people. Many other ministries also focus on serving people in need. At the Shrine of the Holy Sepulchre, Sister Maria Socorro Garcia, OP, focuses on the needs of people living in poverty. Sisters Jules Dungo, OP, Zenaida Nacpil, OP, and Marifi Lugtu minister to street children with the aid of a School on Wheels and on the patio of their community house in San Fernando. Sisters Elise and Marcine were also given a tour of the University of the Assumption in San Fernando by the Sisters who minister there: Sisters Marissa Figueroa, OP, Yolanda Manapsal, OP, and Abegail Santos, OP. On the last day of their stay, a scheduled visit to another community of Sisters was canceled with the tragic death of Sister Amelia Sarmiento, OP, who had been ill. “We participated in a sacred time of mourning with the Sisters, joining them in the first day of the three-day waking of the body before the funeral Mass and burial on December 8,” Sister Elise said. From left, Street children from the Dolores community pose with, from left, Sisters Rosita Yaya, OP, Chapter Prioress; Elise Garcia, OP; and Marcine Klemm, OP. Sisters Elise García, OP, and Marcine Klemm, OP, toured the water purification system at Dominican School of Angeles City. Shown in the photo are Sisters Victoria Changcoco, OP, on the right and in the background, from left, Sisters Meliza Arquillano, OP, Rosita Yaya, OP, and Liberty Mendoza, OP. Please enjoy this video created by our Sisters in the Philippines in honor of Sister Marcine Klemm's 90th birthday. December 21, 2017, Angeles City, Pampanga, Philippines – “In the sixth month the angel Gabriel was sent by God to a town in Galilee called Nazareth, to a virgin engaged to a man whose name was Joseph, of the house of David. The virgin’s name was Mary. And he came to her and said, ‘Greetings, favored one! The Lord is with you’” (Lk 1:26-27). This is the greeting of the angel Gabriel to Mary during the annunciation, words of affirmation of Mary’s role in the salvific work of God. In the school community at Dominican School of Angeles City, angels were also sent by God on December 13 to bring the Good News, bittersweet truth to open the minds of students and faculty, and challenge them in their everyday life. 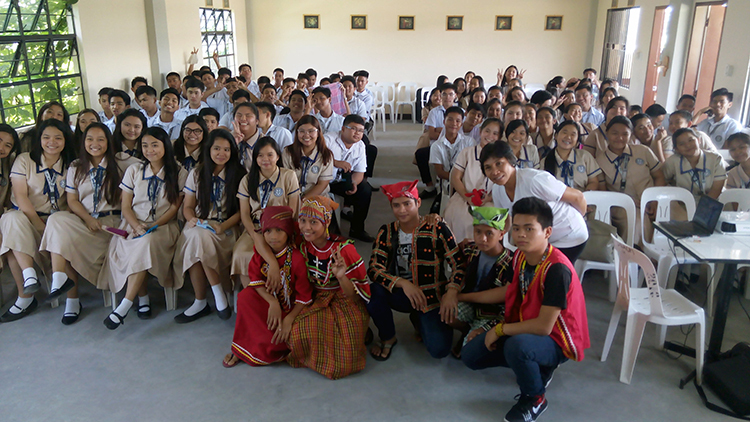 The children from the Lumad indigenous people had been invited to share their experiences with our students to make them aware that outside the four corners of their school are social unrest, injustices, and deprivation of education because of militarization. Our students need to learn that life is more than the social media, Wi-Fi connections, gadgets, the need to belong, and peer pressure. Sister Zenaida Nacpil, OP, Chapter Prioress of Our Lady of Remedies Mission Chapter, based in the Philippines, made this point well. “There is a bigger school of life,” she said. “Education does not depend only on books and we learn not only in school." During the open forum, Jenky, one of the Lumad children, shared her amazement at seeing the huge buildings of the Dominican School of Angeles City. She felt the privileges of the students, who are provided with every facility they need for their education: a safe space, stable rooms, laboratories, armchairs, and every other necessity. Jenky added that, as soon as her group arrived at the school, she felt free and safe. Jenky also said that our students should be grateful for the presence and dedication of their teachers. At Jenky’s school, their teachers are killed. The military are afraid that if the children learn how to read, write, and count, they will have the confidence and fortitude to fight back for their rights. Because of the militarism, most of the Lumad children study every day, wherever they can, yet are still lacking in education. The Lumad children also spoke about the importance of the land. Because life came from the land, they said, we need to treasure and protect it. Many of the Lumad children born on the mountains are deprived of their rights to education, a decent and peaceful life, and the leisure to enjoy their childhood. The Lumad children also said they do their best to preserve their culture, languages, and dances – and respect for the culture itself. Lita, one of the Lumad teachers, spoke of the hard life of the children. They wake up early and till the field before going to school. At the end of the school day, they return to the fields to continue their work. A collective people, they share their harvest with the whole community. Lita also said that the Lumad children desire to finish their education not for money or security, but to give back to their community. Most of them are education students, planning to go back to their communities and teach their tribes how to read, write, and count. Jenky especially mentioned the use of technology in the low land. She said that, in the mountain, technology is never part of their lives, yet they each have a simple and happy life. The day was a time of inspiration and challenge. The Dominican School students received a message that they will either take seriously or let pass and forget. But we teachers and administrators, as their guides, will never get tired of challenging them and exposing them to national situations in the Philippines. We want them to be involved and have hearts for these national situations. We hope that through our guidance, like Mary in the story of the annunciation, they may be afraid of what they heard but later on will accept the truth and stand for it. Lumad children and students of the Dominican School of Angeles City pose during their day together.